This is the latest release from Charles Smiley Presents. He turns his attention to the old Delaware & Hudson and some other northeastern railroad trackage. 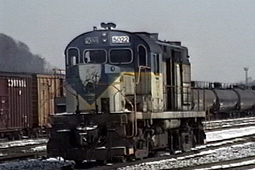 A cornucopia of locomotives are heading these trains. A virtual rainbow, in a collage of paint schemes. Many fallen flags are mixed up in the locomotive lash-ups. 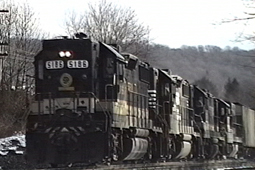 At over 90 minutes, this will be an extended viewing of, former Delaware and Hudson lines. 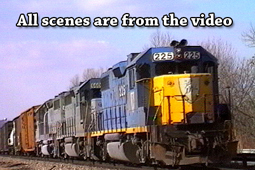 Trainwatching was generally, power centered by the time the 1990’s rolled around. Cabooses were becoming extinct. Larger, standardized rolling stock was less interesting, than earlier eras. In retrospect, viewing the non graffiti cars is a pleasure! There are some interesting freight cars. 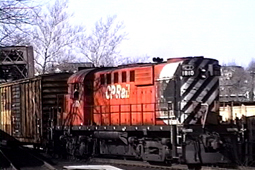 A circus train, general freights,phosphate, coal, and ore trains, are some of what is shown. Some fallen flag gondolas with assorted loads. Still visible, are some of the older road names; on some boxcars, covered hoppers and the other freight cars. The trademark CSP custom-made maps are used extensively. These are very labor intensive to make. The many detailed maps, are referred to quite often. I like the maps. Many smaller points along the right of way are obscure. There are various scales, dependent on the area depicted. Multi- state maps, for system overviews, right down to single track mainline. It is nice to have a feel of where we are, and with all of these maps, you’ll know the locations. There is varied scenery. Some unusual views add interest. Proshot video, consistently provides clear views of the unending action. Tom Luckey certainly has a great eye for composition. Mr. Luckey also has the technical prowness to capture the trains in a pleasing and fun manner. Check his work on Mountain Grades of the B&O, also from CSP. The live soundstage is excellent. Fine editing is always another hallmark of a CSP program. Memorable extended segment at Bridgeport. Model the stone wall type rockface and the shelf style track. There is a prototype for everything! This is a contemporary type of program. It is focused on the task at hand. We don’t get all of the historical, and vintage film viewpoints. We do get a large overview of the listed areas trains in a long strech from the early 1990’s. Speaking of trains…. An amazing array of road power is on display! This was the age of home road, leased, merger and pool power. Some roadnames: CP Rail, Delaware & Hudson, Conrail, Norfolk Southern, Susquehanna, CSX, Chessie System, Seaboard System, Guilford, Southern, Santa Fe, Soo Line, Family Lines, RF&P, Seaboard Coast Line, Grand Trunk…more. Also leasing companies such as; GATX and PLM are seen. The engines are in a multitude of paint schemes. Lightning stripe D&H are a welcome sight. 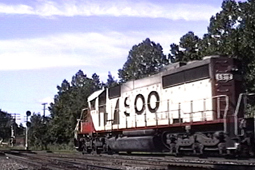 Many models of locomotives from: EMD, GE, MLW (Alco Canada types). The narration is understated on this show. It’s there, but much of the time, in a backing role. Of course, Delaware and Hudson is discussed. 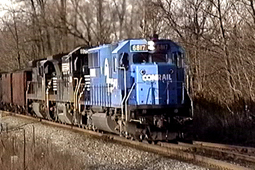 There are some other historical insights, such as Conrail , pre- Conrail, and Palmertown. Natural live sound dominates the scenes. Personally, I am always interested in the intelligent, wide ranging, Charles Smiley commentaries. I do miss the extra information we usually have. This is a very well done production. Just a shade under the usual high altitude, over the top, CSP show. Still far better than most of what else is available. You just can’t beat the array of locomotives. Will please all railfans. Another winner from Charles Smiley. 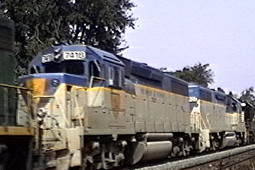 This entry was posted in ATVR Reviews, Charles Smiley Presents and tagged American Train Video Reviews, B&O, Canada, Chessie System, Conrail, CSX, new releases, Norfolk Southern, Pennsylvania, Railroad, Santa Fe, Train DVD by William J. Hudson. Bookmark the permalink.